My blogging and recent book focuses on my primary audience, the CFO and the Office of Finance. Some of the content is CFO specific, but the guidance with respect to relationships applies across the executive suite. 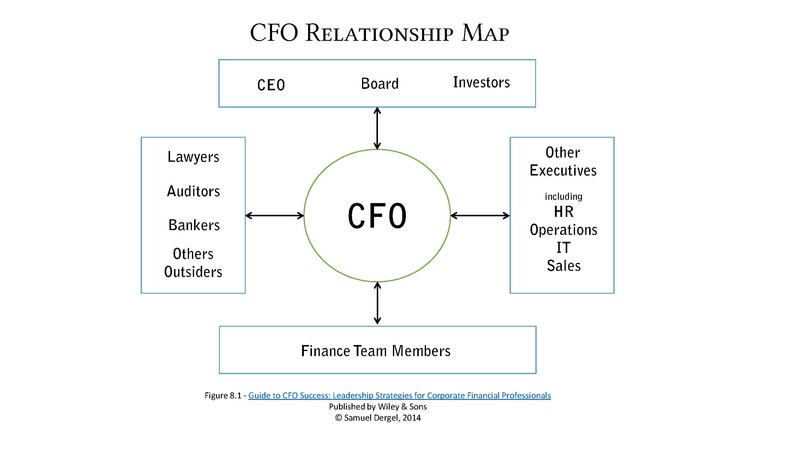 Guide to CFO Success spends a few chapters dealing with relationship management for the Chief Financial Officer. A key tool in this discussion is my CFO Relationship Map, a copy of which is visible below. Depending on your own situation, your personal Relationship Map will look different. However, like other executives, you have people you work for, work with internally as well as externally, and have people that support you. It is important to visually identify al the relationships you have, so you what relationships you might neet to cultivate. In fact, using the Relationship Map may help you realize you have many more corporate relationships as you initially thought. In my years as a financial executive coach, I've seen people use these maps to cultivate relationships they didn't even know they had. You can map out your own relationship, using the blank Relationship Map or creating your own. After identifiying the important corporate relationships, you can create your personal action plan to make the most of them. This map will help you understand who exactly expectations from you, so you can manage those expecations as best as possible. Post originally appeared on the Blue Steps website.